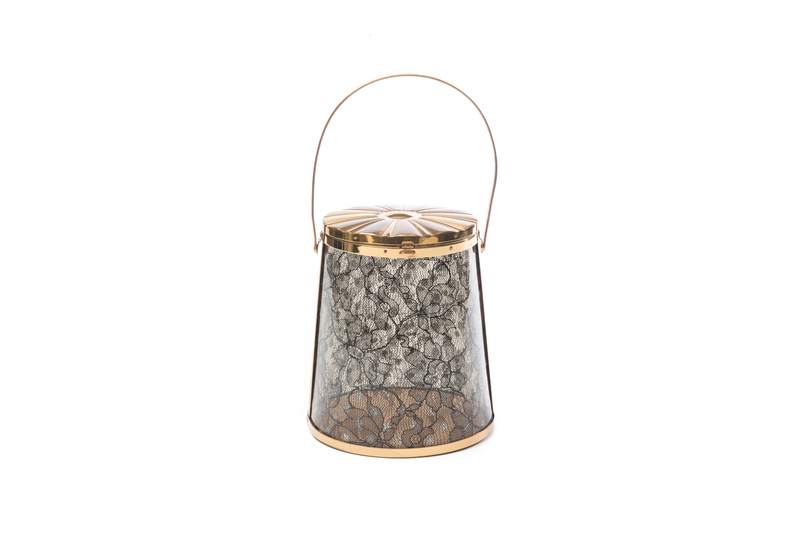 Purse; Round, lantern-shaped handbag made of black lace in an allover floral design with metallic silver flocked dots set between thin sheets of clear plastic. The body tapers slightly inward toward the top, and is held taut at sides by the goldtone metal frame. The narrow handle is curved and attached to the frame at sides. The hinged lid is embossed with a large sunburst design, alternating brushed metal with shiny metal "rays". A small push-button clasp closes the lid at center front. Purse has a solid goldtone metal base, lined on the inside with pale gold silk satin. A round mirror is attached inside the lid.